-30- is newspaper jargon to signify the end of a dispatch or story, and these fifteen essays, says Madigan, an editor and writer for the Chicago Tribune, will help readers understand what is killing the big-city papers. The Chicago Daily News, the New York Herald Tribune, and the Philadelphia Bulletin are among some of the larger papers that have folded in recent years. 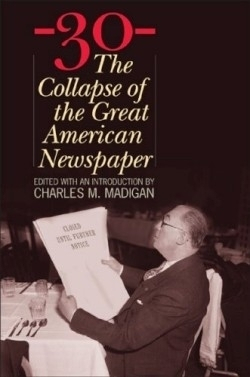 -30- is critical in understanding the decline and fall of America’s major newspapers. The impact of the Internet is chief among the causes, with its immediacy and what Madigan calls “the zero-dollar cost of entry, making newspapers seem every bit the nineteenth century institution they are.” Another reason is unrealistic expectations of profit. According to Time, only commercial banks and pharmaceutical companies rake in more profits than newspapers. Yet the loss of these huge margins has investors rushing to cut costs, and with that, ultimately, quality. Philip Meyer, the author of The Vanishing Newspapers, argues that the papers aren’t really that troubled. He believes that they are just accustomed to making too much money. Writer Neil Hickey seconds that and poses the question: “What happens when the drive for profits collides with the social responsibilities of institutions that play a role in stretching beyond business formulas?” Michael Wolff goes on to posit that billionaire owners may or may not be the solution to the industry’s problems and wonders if we should turn back to the days when the names McCormick, Hearst, Knight, and Pulitzer defined the ownership of daily papers. Other contributors to -30- include David Carr, the New York Times columnist, who points out that the younger generation of readers get their news on their laptops, and Jack Shafer, an editor and commentator at Slate, traces the newspaper industry’s insecurity back to the 1970s. Madigan concludes that the remaining great city papers will not disappear overnight. They may be diminished; they may or may not figure out how to tap the promise of the Internet; they may revert to an ownership that looks a lot more like the era of the media barons. But no matter what direction they turn, they are still creating millions of dollars in profits every day.